Our flower CSA program is a great way to receive our fresh, beautiful, sustainably grown flowers all summer long and in turn you are supporting what we do. We put a lot of love and care into our flowers and we think it shows. What is a CSA? CSA is an abbreviation for Community Supported Agriculture. When you become a member of our CSA, you are buying a “share” of the flowers that we grow each season. for Our 2019 Flower Shares! The general comments we received last season were, “my flowers lasted longer than one week!” so we have gone to an EVERY OTHER WEEK program. But if you would like to receive flowers every week, just order 2 of any FEAST and let us know you want flowers every week for that season! The following ‘Feast’ shares are intended to give you a generous sampling of our flowers and is perfect for flower enthusiasts who want to create their own arrangements! 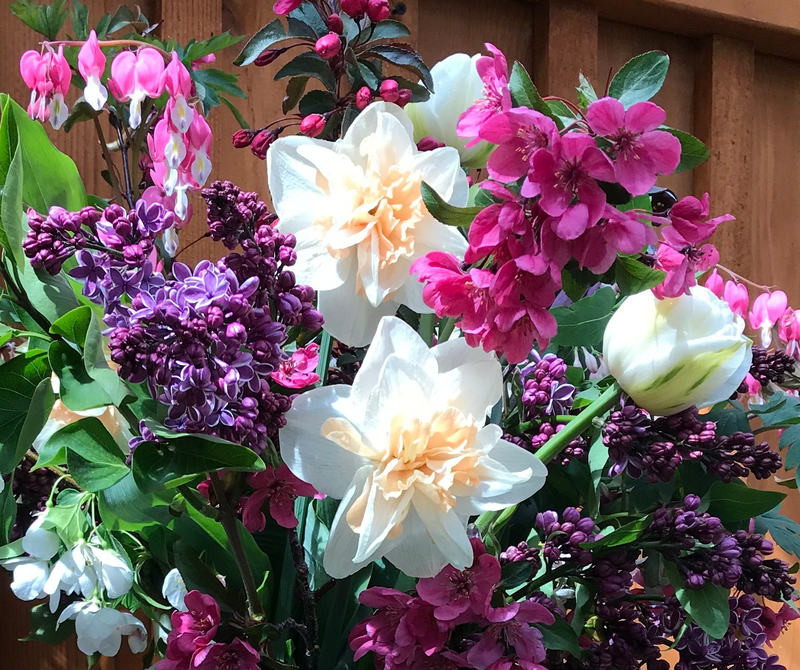 This tasty share will feature (4) large bunches every other week of our beautiful spring blooms, like our unique daffodils and tulips, anemones, hellebores, sweet peas, lilacs, other blooming branches, and more! Your fresh bunch will be ready for you to create a beautiful arrangement! Our Spring blooms are guaranteed to chase the gray of winter away! This jam-packed feast will keep you satisfied this summer! Enjoy (4) large bunches every other week of our favorite summer blooms. A feast of peonies, roses, snapdragons, sweet peas, hydrangeas, zinnias, dahlias, clematis, berry branches, and more! Oh the colors of summer! This one should not be missed! This share will give you (4) big bunches of pure deliciousness! Dahlias, David Austin Roses, hydrangeas, blooming vines, gorgeous fall foliage, hops, asters, snap dragons, and bits and pieces of garden heaven! We call this share the ‘Diva’ share cause it will be full of garden drama and drop dead gorgeous! Are you still hungry for more flowers? This is the perfect option for those who want a beautifully arranged display of our blooms. Each large arrangement is perfectly designed and will feature the best blooms from our gardens each week! These arrangements will include our premium blooms like peonies and roses, and always a dash of our ‘secret sauce’ ingredients! Your bouquet will be ready to place it in your own vase and enjoy. Each bouquet is designed by our floral artists and will always feature our finest blooms. We hope we have created an option for you to feast on our fresh flowers all season long! And be sure to ask about our DIY Bridal Parties too! Previous Previous post: Our latest News! Next Next post: Plant a Spring Basket! In your first picture, there are castor bean pods!? Wow, that is something not often seen! YES! It’s a fantastic floral goodie from the garden!